London South Bank University Drama and Performance students perform Kay Adshead’s gripping, powerful, poetic and heart-wrenching play, directed by Moji Kareem. 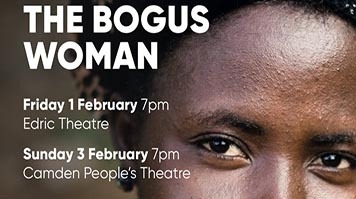 The Bogus Woman is based on real-life experiences of asylum-seekers at Campsfield and Tinsley House Detention Centre. We follow an unnamed woman who has fled unspeakable abuses. She arrives in Britain to seek asylum and start a new life, but conversely is confined, interrogated, humiliated, abused, and striped of her human rights. With her we meet an array of characters; detainees, guards, protesters, and solicitors, the desperate, the empathetic, and the ruthless. This play shines a stark a light on the hidden world of the UK asylum process. Written 10 years ago, this play is more resonant than ever, as attitudes towards immigration are defining the cultural and political position of the UK. The Bogus Woman was originally produced by Mama Quilla, an award winning woman-lead theatre company, dedicated to spotlighting human rights issues. Artistic Director Kay Adshead. This is a non-professional production, performed by students in training on BA Drama and Performance at LSBU.